You will probably wonder why part 2, since there wasn’t part 1 – and wtf is an IDEA DINNER you ask? Okay here it is: Idea dinners is part of my blog that will contain simple, traditional, not fancy yet very tasty ideas for daily food. It’s just basic food that was eaten for ages in my family home. Also the reason for this is, that sometimes you just don’t want fancy, you crave old school flavours and simplicity plus you just don’t have time/will etc. for fancy. As 1st part it was meatballs with beetroots. It’s a very effective meal for family 2 day not too expensive dinner. 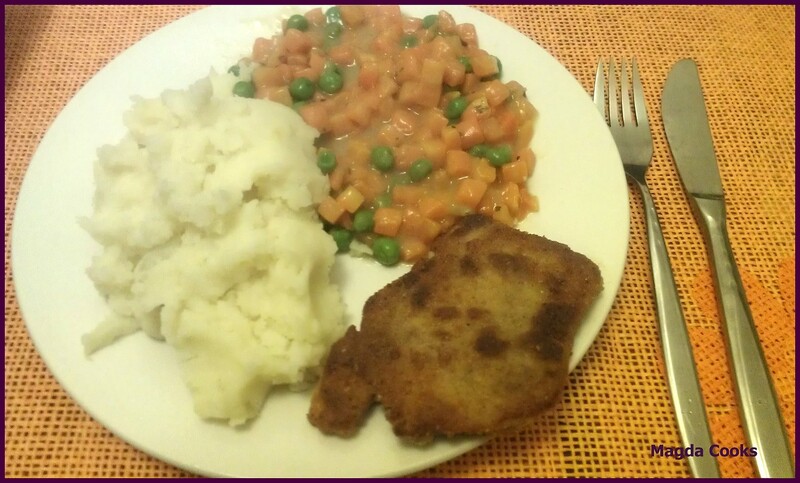 The part 2 I would like to propose today is pork chops with carrots and peas and mashed potatoes or fries, but it goes the best with mashed potatoes. Every one of my polish friends knows these ingredients and most likely ate it on a regular basis throughout childhood 0_o. The only recipe today I’ll give you for peas and carrots – you will be surprised – the recipe is not my Moms, but Mom of my friend Ms Ds. I ate it a couple of times at her parents house and liked it so much that I asked for the recipe. And Cookies absolutely loves this. Place veggies in the pot, cover with cold water and start cooking. Add bouillon cubes and wait until boiling. Boil for 10 min. then check if veggies are as soft as you want it. In the meantime place butter on small pan and melt it slowly, add flour and mix good. The mixture should be peanut butter thick and creamy. Pour most of the water from peas and carrots, spice with pepper and tarragon. Add butter mixture into the skillet and stir until liquid is thick and veggies covered, keep cooking it on the small heat until flour flavor disappears. Serve with traditional pork chops, meatballs, baked or stewed chicken. It best goes with creamy mashed potatoes as the other side. P.S. Cookies thoughts: FEED ME MORE! Magda Cooks… it just right.